In the gathering, Professor Anu Muhammad demanded the formation of a wage board for the garment workers in the garment factory and the minimum wage is 16 thousand taka. He said, garment industry is enriching the economy. And its workers' wages are below the poverty line. No worker's wages can be below the poverty line. Anu Muhammad said that the use of special power law was made in the fearful environment of Ashulia. There the workers who are not getting proper wages, garment workers are being kept in the garbage, those workers are being arrested, detained, and remanded. He urged the government to stop the arrest, remand and harassment of workers in Ashulia. Hamida Hossain, convener of the Labor Security Forum, said, as soon as possible, the problems of the workers of Ashulia should be resolved. The rally was to be held in front of the National Museum in Shahbagh. But it was not allowed to do so. 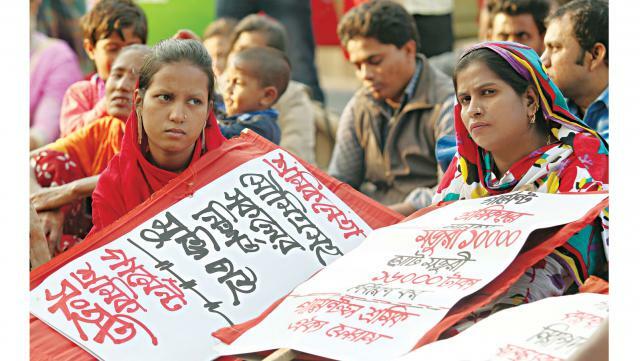 Taslima Akhter, the chief of Garment Workers' Solidarity, condemned by saying that why the workers who are keeping the country's economy in front of them cannot stand in the Shahbagh for their fair demands ? The rally demanded immediate release of arrested workers and withdrawal of cases against them. in Different gatherings, The leader-workers of the labor organization and unity forum have given solidarity speech. BAN-members participated and contributed to organize-mobilized garments workers to successful of the meeting. BAN, strongly believe that in the traditional so called workers party based movement will not free the working class, because still they are following authoritarian approach. To expediting the anarchist movement in the industrial zone and spreading the Ideas of Solidarity, Direct action and self-organizing. BAN Producing and distributing propaganda materials . garment industry is enriching the economy. And its workers' wages are below the poverty line. No worker's wages can be below the poverty line.